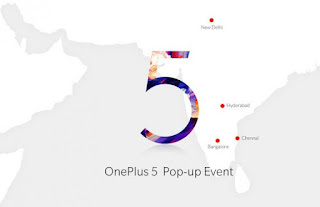 OnePlus to launch OnePlus 5 on 20th June and In India on June 22 Now OnePlus has announced that it will hold popup events in 4 India cities – New Delhi, Bengaluru, Chennai, and Hyderabad, from June 23rd to 25th. Popup events will offer an exclusive chance to experience and buy the OnePlus 5, but there will be limited stocks. OnePlus 5 to come with a 5.5-inch (1920×1080 pixels) Full HD Optic AMOLED display powered by a 2.4GHz Snapdragon 835 SoC with 6GB/8GB of RAM and 64GB/128GB internal storage. On camera, it has a 16-megapixel rear camera and 16 MP front-facing camera. OnePlus 5 will have a Dual Rear camera.It runs on Android 7.1.1.It will come with Fingerprint Scanner and NFC support. OnePlus 5 India launch event takes place at The National Sports Club of India (NSCI) Dome in Worli, Mumbai and starts at 2 PM. The smartphone will be available from June 22nd at 4:30 PM exclusively on Amazon.in.